But it's also pretty incredible in terms of what it is capable of doing. Happy Halloween. Leave it to the Japanese to create a robot that is both incredible and will also haunt your dreams: a new robot can do push-ups long after its motor should have failed because it could sweat. Yes, really. Robots generate a tremendous amount of heat as they move around, which is usually what confines their ability to operate as effectively as humans. 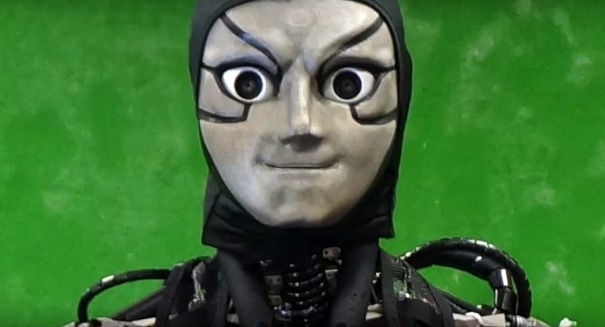 But researchers from the University of Tokyo have found a way to cool a humanoid robot with a freaky appearance whom they’ve named Kengoro. Just like humans, it’s able to sweat water. Kengoro’s frame has channels that allow water to flow around its body, seeping into areas near the surface of the bones allowing it to cool the 108 motors in the humanoid before it evaporates. That’s a lot different from a typical water-cooled radiator system, and a lot more similar to how humans operate. It allowed Kengoro to do 11 minutes of push ups, long after it would normally fail. And the more it “drinks,” the longer it can go. The study is titled, “Skeletal Structure with Artificial Perspiration for Cooling by Latent Heat for Musculoskeletal Humanoid Kengoro,” and it was authored by Toyotaka Kozuki, Hirose Toshinori, Takuma Shirai, Shinsuke Nakashima, Yuki Asano, Yohei Kakiuchi, Kei Okada, and Masayuki Inaba from the University of Tokyo. The study was presented this week at IROS 2016 in Daejeon, Korea.